It’s been over 20 years since the Soviet Union splintered into 15 independent nations, but memories of the socialist state’s military might and vast expanse linger in the region’s consciousness. Links between Moscow and Belarus, Eastern Ukraine, Transdniestria and the controversial Georgian provinces of South Ossetia and Abkhazia remain strong, while anti-Russian sentiment in cities such as Lviv, Tallinn and Tbilisi may never abate. Football, much like the other Olympic sports, the arts, science and technology, magnified the achievements and the failures of the Soviet state. From an empire struggling to rebuild following forty years of unrelenting war, famine and violent repression, the Soviet national team emerged in the 1956 Melbourne Olympics as one of the most dominant squads in the world, winning that tournament as well as the 1960 European Championships, advancing to the Euro finals in 1964 and 1972, and finishing 4th at the 1966 World Cup. 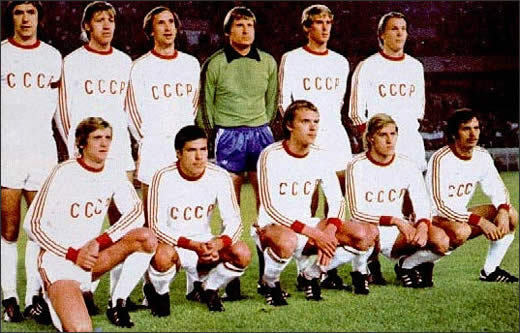 During those glory years, the squad’s roster evolved, featuring an increasing number of non-Moscow, non-Russian players. If in 1956, 18 of the 21 members of the team in Melbourne hailed from the Russian heartland, including an astounding 16 from Moscow and Moscow Region, by 1966 less than half of the footballers used in Russia’s World Cup qualifying campaign and semifinal appearance in London were from Russia. In 1972 Ukrainians even outnumbered Russians on the squad. Still, the development of football talent in Soviet republics had its specificities. From 1956 until 1974, only one player from Central Asia, Uzbekistan’s Yuri Pschennikov, was included on the Soviet national team roster for an official match. At the same time, the Transcaucasus republics of Armenia, Azerbaijan and Georgia, with 1/3 the population of Central Asia, were represented by 16. The majority of non-Russian players, of course, came from Ukraine and the Dynamo Kiev machine, arguably the Soviet league’s most successful club from 1965-1990. The Baltic nations – Latvia, Lithuania and Estonia – had just two representatives from 1956-1974, Riga’s Leonid Ostrovsky and Tallinn’s Georgy Ryabov. Moldova and Belarus were shut out entirely (though some may count Dinamo Minsk’s Eduard Malofeev, who played on the national team in the late 1960s, as a Belarusian, though originally from Krasnoyarsk, Russia). Despite outliers like Georgia’s football clubs, which boasted 26 national team invitations to official matches from 1956-1974 (10% of a total 260 invitations), while representing just 2% of the total Soviet population, Soviet football belonged almost exclusively to Moscow’s big 5 – Spartak, Dinamo, CSKA, Lokomotiv and Torpedo – and in later years, Dynamo Kiev. Moscow ran the Soviet Union, receiving a disproportionate share of the nation’s resources and investment, and talented footballers from the provinces, frequently ended up playing club football in the capital. When the Soviet Union dissolved in 1991 and each of the 15 republics began to compete independently in World Cup and regional qualifying, the balance of power became quickly visible. Russia and Ukraine, with the biggest populations and most developed economies, have reached both the World Cup and European Championships. Otherwise, only Latvia has reached a Euro tournament (2004) and Uzbekistan and Turkmenistan – the Asian Cup. With two matches to play in AFC World Cup qualifying, Uzbekistan is on the verge of sealing a place in Brazil. If they make it, they will be the third of the post-Soviet republics to reach football’s biggest stage. Football, in most instances, reflects the economic condition of the region. Central Asia, underdeveloped in almost every area of economic and public life during the Soviet era, has struggled to move forward independently. FIFA rankings – Uzbekistan – 66th, Tajikistan – 112th, Turkmenistan – 131st, Kyrgyzstan – 142nd, Kazakhstan – 144th – serve as additional evidence. Georgia, Armenia and Azerbaijan enjoyed more football success in the Soviet period. Ararat Yerevan won the Soviet league in 1972, while Dinamo Tbilisi followed in 1978. Azerbaijan’s top club, Neftchi Baku, also enjoyed a 3rd-place finish in 1966. But the violent 1990s ravaged the region’s infrastructure and football investment dried up. Recently, Georgia and Armenia have improved – Armenia nearly made it to Euro 2012 – but it may be a while before the South Caucasus makes noise internationally. On the Eastern European front, Ukraine and Russia dominate the scene, while Latvia and Estonia have also had some success. Solid economies and political stability may well explain why those two nations, the Soviet Union’s smallest population-wise, have outperformed bigger countries such as Georgia, Azerbaijan and Belarus. In 2011, Estonia lost in a playoff with Ireland to miss out on Euro 2012, while Latvia reached Euro 2004, as mentioned earlier. Belarus did nearly reach the playoff round in 2002 World Cup qualifying, but hasn’t made it close since. Lithuania, likewise, came close in 1998 World Cup qualifying, but has struggled in recent years. Moldova, one of Europe’s poorest nations, generally plays the role of punching bag in UEFA qualifying campaigns. So what would the hypothetical Soviet Union XI look like in 2013? Could the squad contend for honors at the World Cup and Euro, as it once did on a regular basis? It’s been 25 years since the Soviet Union reached the final of the 1988 European Championships. Since then, Ukraine’s quarterfinal appearance in the 2006 World Cup and Russia’s semifinal run at Euro 2008 are all the former Soviet Union can boast. I’ll let you decide. Managed by Spartak legend, Oleg Romantsev, coaxed out of retirement by the prospect of World Cup glory and an under-the-table Marlboro endorsement, the Soviet XI would feature explosive Armenian and Ukrainian talent up front and the sturdy, veteran defensive spine of the Russian national team. The squad would favor an unconventional 4-1-4-1 formation, though able to quickly slide into a 4-2-3-1, if needed. 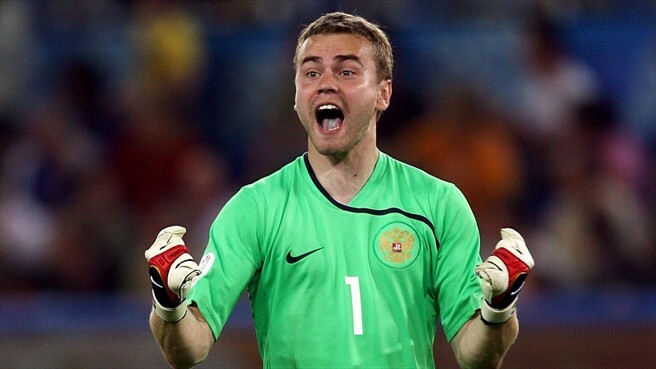 Akinfeev has 58 caps, dating back to 2004, when he became the youngest debutant in Russian national team history at the age of 18. He played all five matches for Russia at Euro 2008 and regained his place as the country’s number one last fall after recovering from crucerior ligament injuries suffered in 2011. Still just 26 years old, Akinfeev may very well be in goal for Russia at the 2018 World Cup to be played in his home country. Russia’s best footballer thus far in the 21st century, a brilliant second half to his career would give Akinfeev a place in history alongside former Soviet and Russian legends, Lev Yashin and Rinat Dasayev. The 33-year-old defender has been a stalwart for CSKA since moving crosstown from Lokomotiv in 2004. He made his professional debut in 1999 for Krylia Sovetov and national team debut in 2002 in a friendly against Sweden. He’s been rated one of Russia’s best defenders over the past dozen years and highlights, alongside the Berezutski brothers, the Russian league’s sturdiest defense this season. The third point on the rock-solid CSKA triangle that will guarantee confidence at the back for the Soviet side, Berezutski has partnered with Ignashevich and Akinfeev at CSKA since 2003 and earned a regular place on the national team in 2005. While Berezutski, like Ignashevich, is in his early 30s, there isn’t an abundance of talent at this position and the excellent communication between the three CSKA men at the back has been a big reason that Russia is yet to concede a goal in 2014 World Cup qualifying. Perhaps the least-rated member on the team, Anzhi left back Eschenko had been in terrific form before suffering a serious knee injury on March 31. He’s out for six months, but will be expected to return to a starting role at Anzhi as well on the Russian national team. Eschenko made his national team debut in September 2012 and quickly earned Fabio Capello’s trust, earning more playing time in recent matches than better-known wide backs such as Aleksandr Anyukov, Dmitri Kombarov and Yuri Zhirkov. His move to Anzhi in January from Lokomotiv confirmed how far his star had risen in just a year. Eschenko is a physical, skilled back, who loves to push forward with the ball. He was a bright spot in Anzhi’s otherwise dreary start to 2013. The first non-Russian on the list, Gusev has been a stalwart for Dynamo Kiev and the Ukrainian national team since the mid-2000s. He plays both midfield and defense for his club and, much like Eschenko on the opposite wing, would provide a bruising, attacking presence on the Soviet XI’s right wing. He has been recognized as Ukraine’s top player in 2005, 2007 and 2011 by various publications and with a wealth of Champions League, World Cup and Euro experience, would serve as an excellent mentor on the team. Despite a severe salary dispute last fall with club management, which led to a lengthy spell on Zenit’s youth team, Denisov has played every minute of Russia’s 2014 World Cup qualifying campaign. The 28-year-old St. Petersburg native is also back in the Zenit starting lineup and would be the best candidate to hold down the midfield in a 4-1-4-1 formation, given his combination of strength, speed and creativity. Denisov is generally viewed as one of Russia’s top three footballers, alongside Akinfeev and Zenit teammate Roman Shirokov. A late bloomer, the 31-year-old Shirokov debuted in the Russian Premier League in 2005 and for the national team in 2008. He has been on a tear in the last few years, however, scoring nine goals in 39 appearances this season, including four for the national team, to go with 21 goals in 57 appearances during the extended 2011/2012 season. Shirokov has excellent ball control and field vision and could also drop back to help Denisov, given his experience as a center back early in his Zenit career. He’s also one of the Russian Premier League’s most confident penalty takers. Just 24 years old, Mkhitaryan may be the most exciting player in the former Soviet Union right now. He’s been a key member of high-flying Shakhtar Donetsk since 2010, scoring 39 goals in 98 appearances and has already attracted attention from top Western European clubs. On the national side, he spearheads an up-and-coming Armenian squad that came close to qualifying for Euro 2012. Mkhitaryan is skilled both in attack and as a deep-lying midfielder, much like his Russian counterpart Roman Shirokov. The duo of central/attacking midfielders would provide a challenge for defenses across Europe. Another youngster, 23-year-old Konoplyanka was named Ukraine’s top footballer in 2012. Though he’s missed some time this spring due to injury, he scored a beautiful goal against England last September in World Cup qualifying and will be a key player in Ukraine’s efforts to catch Montenegro and England in five remaining qualifying matches. Konoplyanka has pace on the sideline, as well as a strong right foot and good dribbling. It won’t be long before he moves on from Dnipro. Ukraine fans hope he’s the nation’s next huge star. Also just 23, Yarmolenko will partner with Dynamo teammate Oleg Gusev on the right wing, providing speed and a penchant for cutting inside as a supplementary forward. He scored against both Poland and Moldova in March and represents the future of the national team, along with Konoplyanka. Yarmolenko has also been linked abroad, but Dynamo will be loath to see him go after 38 goals in the last three seasons. The second Armenian on the squad, recent Spartak signing Movsisyan, previously of RealSaltLake and Krasnodar, may be the second least-established member of the Soviet XI. Nonetheless, the 25 year old gets the nod given the lack of talent at the position. Russia’s Aleksander Kerzhakov is fading at Zenit, while Ukraine’s Yevgen Seleznev and Roman Zozulya don’t offer as much potential. Movsisyan leads the Russian league this season with 13 goals in 18 appearances, including four in his first five matches with Spartak, and combined with Mkhitaryan during Euro 2012 qualifying to make Armenia one of the most exciting attacking teams in Europe. A strong physical presence up front, Movsisyan will be a perfect target for the bevy of skilled passers stretched out behind him. This entry was posted in Hypothetical XIs and tagged Andrei Yarmolenko, Andrey Eschenko, Armenia, Evgen Konoplyanka, Henrikh Mkhitaryan, igor akinfeev, igor denisov, Oleg Gusev, oleg romantsev, roman shirokov, russia, Sergei Ignashevich, soviet union, ukraine, vasili berezutski, Yura Movsisyan by Andy Shenk. Bookmark the permalink. But I notice that Aleksandr Anyukov plays in right back position in Zenit but not left back. I just meant that Anyukov is a more established wideback, not left back, like Eschenko. Sorry for the confusion. I see your point with Kokorin over Movsisyan. Kokorin was at the very top of my list of players omitted. why not Aleksandr Kokorin, Aras Özbiliz,Alan Dzagoev? I like all of them, certainly. The Ozbiliz goal against Spartak this spring was sensational! But, I think that Yarmolenko, Konoplyanka and Movsisyan up front would be a bit better. I do think I would have had Dzagoev in the squad last summer, but he’s dropped a bit in my mind because of lack of playing time on the Russian national team. And Kokorin may very well be the best player in Russia soon if he continues to develop. Thanks! Yeah, there are a lot of interesting options. It’s a great topic of conversation.